Mamie A. Cravens, 97 of Taylorville passed away on Monday, November 12, 2018 at 5:35 p.m. at Taylorville Memorial Hospital in Taylorville, IL. She was born on January 1, 1921 in Cuba, MO, the daughter of Hugh and Ellen Carry. She married James Wheeler Cravens on June 12, 1936 in Taylorville, IL and he preceded her in death on June 1, 2000. She worked as a school cook in the Morrisonville school district and a homemaker. 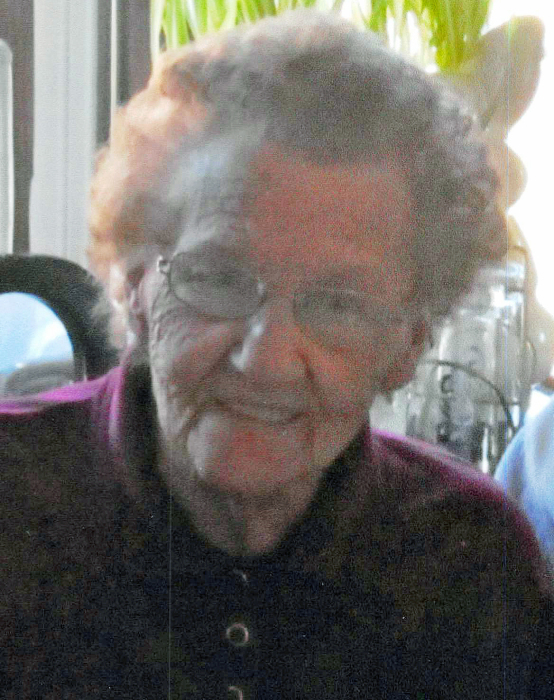 Mamie was a hard-working woman, being a school cook and taking care of her family. She raised a huge garden, push mowed 3 acres and she was a fantastic cook. Mamie was famous for her blackberry cobbler that everyone requested for family gatherings. She loved her family very much and she never ending a conversation that she did not say “ok love you”. She is survived by her Daughters: Nancy (Dan) Sergent of Auburn, IL; Rhonda (Neil) Hoover of Taylorville, IL; Daughter-in- Law: Phyllis Cravens of Kincaid, IL; Seven Granddaughters and Several Great-Grandchildren, Great-Great-grandchildren, Special Nieces and Nephews. She was preceded in death by her Parents, Husband, Son: Wayne Cravens, Daughter: Marilyn Spires, Granddaughter: Shelly Spires-Reed, Great-Granddaughter: Annessa Goodwin, and all of her brothers and sisters. Visitation will be held on Thursday, November 15, 2018 from 9:00-11:00 a.m. at Sutton Memorial Home in Taylorville. Funeral service will follow the visitation starting at 11:00 a.m. at Sutton Memorial Home in Taylorville with Pastor Jack Greenwood officiating. Burial will be held in Mt. Auburn Cemetery in Mt. Auburn, IL. Memorials may be made to the Mt. Auburn Township Cemetery for maintenance costs C/O Sutton Memorial Home 327 N. Clay St. Taylorville, IL 62568.